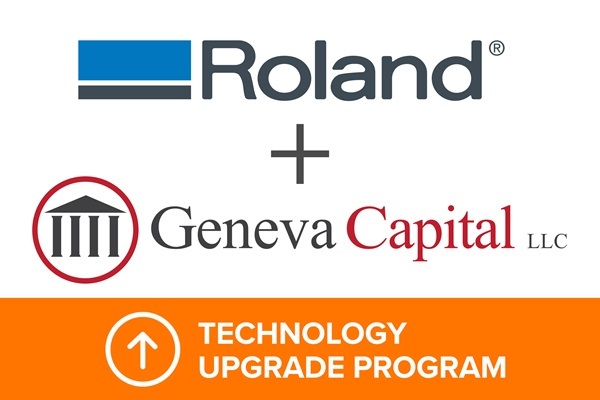 Roland DGA Corporation has teamed up with financing company Geneva Capital to launch a new “Technology Upgrade Program” for Roland customers throughout the U.S. In addition to making easy to qualify for financing a new Roland device, the program allows customers to upgrade to new models in as little as 12 months to remain competitive in an ever-changing business world. Along with the convenient upgrade option, the program offers other benefits to Roland customers, including low monthly payments (OAC), accelerated tax write-offs, short loan terms of three years or less, and the ability to keep purchased equipment under warranty. “By taking advantage of the new Technology Upgrade Program, Roland DGA customers can maximize their profits, enjoy the extra peace of mind of continuous warranty coverage, and have the option to upgrade their devices frequently to keep up with growing business and production requirements,” said Tony Miller, Vice President of Sales and Product Management.